October 17 - As we move south I try to keep up the website and logs. 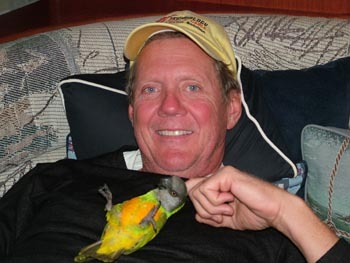 Of course, Jimmy Buffett gets jealous and he wants to help, so I've found that the best thing is to get him out and let him sit on me and at times he will actually come up and help me peck at the keys. By the way, you might not have noticed yet but my hair is starting to grow out. I have this deal with Bill that when we go to the Bahamas that we won't cut our hair. I know, it sounds like I'm going back to the 70's but I've noticed that the style is longer hair now. So, why not! Of course that doesn't mean I can't thin it from time to time so I have been thinning it a bit. Just you wait, it will be a picture in a few months, the long haired hippie in his 50's. If you were wanting to see sunsets again, you are in luck. 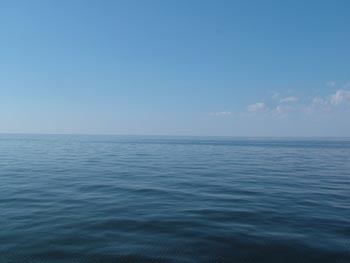 The picture we took to the lower left is one at an anchorage on our way south from Norfolk. Beautiful! As we were moving south, we saw another Gemini. He was loaded down more than we were so he was moving slower. We have now seen them several times as we are headed to Oriental. They have been to the Bahamas' two other times and they are headed there again this year so I'm sure we will see them in the Exuma's. 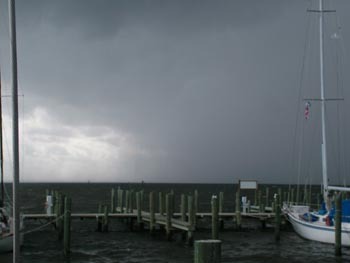 Last time we crossed the Albemarle Sound we had 42 knot winds and 6 foot seas. When I told Deb we were about to cross the sound, she was worried. However, looking at the picture to the left you can see she didn't have anything to worry about at all. 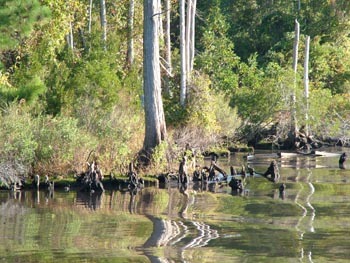 We motored across the sound and into the Pungo Canal where we had to avoid a number of floating sticks and logs. I actually called a friend who is heading down in another week and told him to watch out as he came through the Canal for the stuff floating. Oh well, I guess that is part of cruising but thank goodness for cell phones now. The picture to the lower left is one at sunrise at our anchorage and what always amazes me is that it really doesn't look that much different. Of course the real thing is that we are usually asleep at sunrise so we just don't see it. 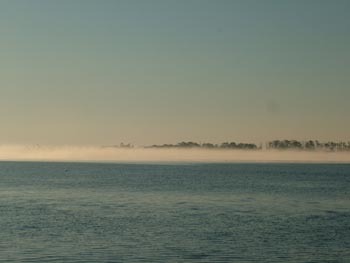 When we got up looking in another direction, we also saw fog. 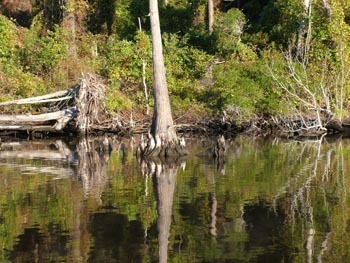 Fortunately it was only on the banks of the land and not in the waterway itself so we could continue moving south. As we went through the canal and more canal's we say a number of trees with the knees of the roots sticking up. This reminded me of the cypress trees at Reel foot Lake in the midwest. Some of the sights we see are just beautiful and I'm really happy to have my good camera back so we can capture a few of them for you too. The reflections in the water are amazing along with the fact that the Corp of Engineers or their subcontractors, dug these canals for commercial traffic and of course boats like Freedom to travel through. We aren't to the alligators at this point but it sure looks like we should be there. At this point we are only about 40 miles from Oriental, N. C. Oops, I don't think I've told you yet but we are starting to have a problem with the boat. Nope, I didn't tell you, big problem...... Many boat units will go out on this one. We arrived in Oriental, N. C. and we were lucky to actually tie up to the free dock in town. The first thing I did was to change oil in the engine as I was thinking about the problem I was having with my transmission. Oop's I'm getting ahead of myself. This morning as we were leaving the anchorage, I was slowly moving the throttle forward to our normal setting of 2,650 rpm's and the engine kept going up a 100 rpm's and then back down. It has done this in the past once or twice but then settled down. This time it did it at least 8 times so that wasn't good. It finally settled down and we made it into Oriental. 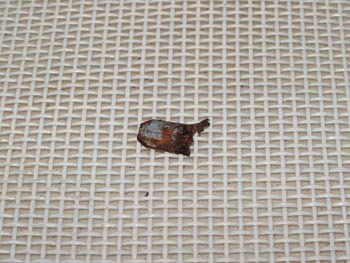 After I changed oil and thought about it, I called my friend Bill to talk about the problem. He actually knew someone in Oriental and gave them a call. They had had some work done in Oriental and they called their friends who lived here who recommended a service yard called Sailcraft Marine Service. We got out our bikes and rode to the marina and met the owner Allan. I have to say, these are some of the nicest people in a yard we have met. They are just like the people at Cobb's Marina. After talking to him about the problem, he said bring the boat over and we could stay overnight there so their mechanic could diagnose the problem. So, we got back on our bikes, went to our boat and after 3 hours at the free dock, we then went to their marina. After talking to the mechanic and only giving him they symptoms, he thought the transmission was slipping. By the way, that is exactly what I thought after feeling and watching the tach. We called around and parts are not available in the US for our transmission. GREAT! Now you would think that if parts aren't available there would be a bunch of transmissions available to change out. WRONG! So I put out an email to the list serve for the Gemini group for help and received numerous reply's ranging from get a different mechanic to I've never heard of a transmission failure on a Gemini. Of course we also had some which gave us hints at where we might find another transmission along with where to find a source for a service manual on the transmission. 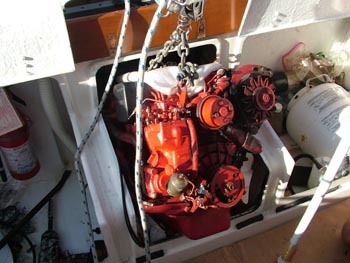 We ended up agreeing on having a sea trial on the boat so the mechanic could experience the failure himself. So the next morning I took him on a ride and this time the transmission started slipping at 2,500 rpm instead of 2650. I guess it was a good thing we stopped instead of moving on. We both agreed that the transmission was bad and now we are on a path of finding one. The next step was to call all of the places that we found out about from the list serve. Thank you by the way. None of them had a transmission. Then we were expecting a call from Engines One and guess what? They actually found one in their warehouse. I guess this is the LAST transmission in the US at this point and I get it. The transmission should arrive on Monday, get painted and then I'll pull off lots of junk from the engine and we will pull the engine and transmission on Tuesday for the transmission to be replaced. Have I told you about boat units? I don't know if you know what BOAT stands for but it is Bring On Another Thousand. So, a Boat Unit is One Thousand Dollars. This repair will cost us around 4 Boat Units. Of course I also took the opportunity to order a spare starter and a bunch of filters too. And none of this includes a possible email I will get back from England tomorrow morning about the flexible coupling and whether or not it should be replaced. If so, we will be ordering it at 7:30 our time so it can be here by Tuesday. I think I'm hearing another Boat Unit calling my name. Don't you just love cruising? Much more on the later updates along with pictures as we actually tear it all out. We are now at another marina which is beautiful and has wonderful showers. In addition, they are new and we got a great weekly rate which is good because there is a front ready to move through on Friday with 20 knot plus winds and I didn't want to be out at anchor without a reliable engine and transmission. $150 bucks for a week is a great deal, after all it is only a little more than a 1/10th of a Boat Unit. So much for now, we are going to take the time over here to get our boat re-polyglowed and do some other minor repairs I've been putting off. So in every problem there is a silver lining or if it has to do with Boat Units, it may be a gold outlay. October 22 - We've been working on the boat while waiting for parts to show up. As you might remember, I just had the boat surveyed so I could get new insurance. As a result, the surveyor found three things that weren't life safety items but thought should be fixed. 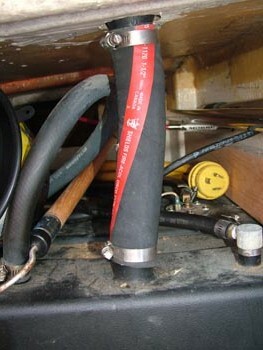 First, you can see to the right the diesel fill hose had once clamp on each end. It was installed this way from the manufacturer. He said there should be two clamps on each end. And now, so there are. Next, I had to remove a number of the outlets installed in the boat and ensure they were all protected with Ground Fault Interrupters (GFI's) which should have meant purchasing two GFI's and having the other outlets down the line tied to the load side. Well, they didn't wire our boat so this will work so, I ended up putting in three GFI's so far and still need to add another one. I guess there are a few hidden junction boxes I haven't found yet. We've also been cleaning the outside of the boat and reworking our Polyglow. Polyglow is like wax but shines better and provides a better protection for the boat. Problem with it however, is that it gets dirt ground into it and after about a year or so you have to remove part of the old stuff and then reapply. For many that is a pain and reason not to use it. I talked to the guy at Polyglow about it and he said if you wash the boat often you shouldn't have to do this. I don't know about you, but when you are cruising washing the boat is hard unless you are in a marina. So, I just take off part and put it back on. By they way, you can see below that a storm came through on one of the days and between the wind and rain, it was a good one. 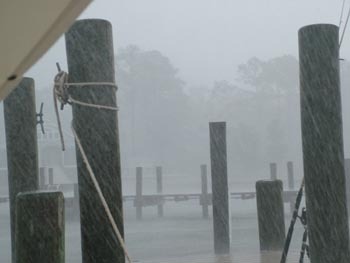 I just got 3 more lines on between the dock and the boat when the 40 knot winds hit. One of the other things that the surveyor wanted fixed is this "hard spot." I have one on each side and it is because the rod from my Teliflex steering hit the side of the boat when fully extended. 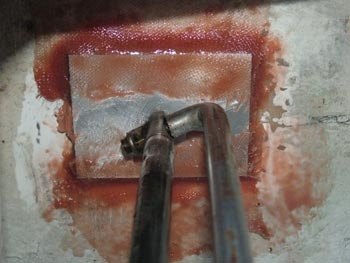 So we agreed the best fix was to put in an aluminum plate to dissipate the load and then fix the gel coat. I cut and installed the aluminum plates by mixing some cotton and epoxy and then gluing the blocks to the side of the inside of the hull. You can see the rod now will hit the plate which will disperse the load. Next, I wetted out some fiberglass and then with more cotton and epoxy to fill the gap, I glassed the block onto the side of the hull to hold it there. I still have to paint it but it's looking like what we agreed to. 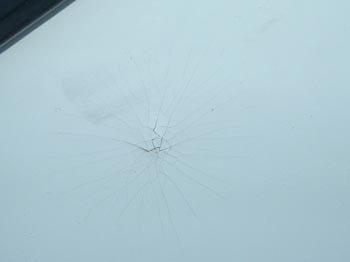 Next I went outside and ground out the gel coat that was damaged and found the fiberglass had no problems with it. I figured that was correct because fiberglass will bend quite a bit rather than crack right away. I learned this with my fiberglass landing gear on my plane. Well, right now I've applied two coats of the new gel coat and today I will be sanding it down and buffing it out. Hopefully the pictures will look pretty good. I think the color match is pretty good too. Today, Monday, is the first day the transmission could be here. We will dinghy over about noon and see if all the parts have made it in or not. If so, we will probably be moving over to the yard this afternoon so I can start taking parts off the engine. If not, then another day of waiting, cleaning, and working on our projects. Oct 23 - We spent the day cleaning the boat and picking up Christmas presents from the Post Office. At least that is the way it seems sometimes. We had 3 boxes that were forwarded from St. Brendan's Isle, our forwarding service. Within them was a new boot for our outdrive, we now have two on board, a new chip for the Garmin to cover the Bahamas and more info in a minute, a new drip pan for our grill, we lost ours on a crossing, and of course mail which included some doctors bills from St. Louis. Now about the Bahamas', we ordered a chip for our Garmin 492 which is an external antenna Garmin and the same as the 498 which is an internal antenna unit. We purchased it from Defender. However, it says on it that it is for Southeast Florida. Now I remember very specifically talking to the reps at the boat show saying we needed the Bahamas. Of course I wouldn't open the little package and plug it in because if you open them you bought them. In the West Marine Catalog it says that this only covers the Southeast portion of Florida and if you want the Bahamas, you must buy the cartridge that costs about 100 bucks more. So what did I do? I called Defender. They called Garmin. I found out that this cartridge does have the Bahamas in it and it is 100 bucks cheaper than the one that says it has the Bahamas. So I guess I got a good deal. I opened it and it worked. SO, if you want the Bahamas for cheaper, you can order the 010-C0227-00 Cartridge. Trust me or just call Defender, it works. I know because I opened it and plugged it in finally and it is great. By the way, these are the Explorer Charts for the Bahamas. After we received our Christmas presents, we also opened up our mail. We received a card from my Aunt Sandy that was just perfect on our one year anniversary of going cruising. Therefore, I will put the card right here on our website, I'm sure I'll be sued but who cares. I give all the credit to Hallmark and I'll even put it in quotes. Pretty cool don't you think! In my mind we are living our dream successfully and I think that is the case as well with my Aunt Sandy. Thanks a bunch. By the way, our transmission and all the other parts came in this afternoon. Great day! They painted it this afternoon and we will be moving our boat over tomorrow afternoon so I can take everything off the engine and we can pull it. 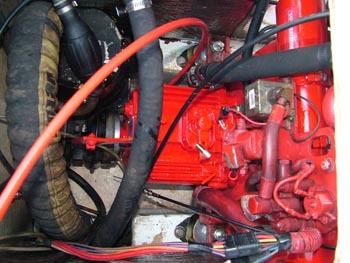 The plan right now is to pull the engine first thing on Wednesday, get all the work done and put it in the same day. Next I will put all the stuff back on the engine and get it hooked back up so we should be out of there by Thursday noon. Then we are back to the slip we have rented and back to finishing up cleaning up the boat. I've neglected our cleaning and since we are here, we will get the cleaning done and we are ready for about another 6 months minimum. This is turning out to be a good bad deal. Take care and enjoy your life, we are! 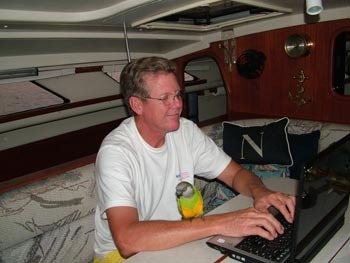 Oct 25 - We moved the boat over to Sailcraft Service on Tuesday at about 2 pm. I spent the afternoon taking everything off of the engine that I needed to to pull the engine. Of course Deb was already threatening to take the "plumber picture," you know, the one where his back side is up in the air with the crack showing. My crack wasn't showing but I will guarantee you that in all of the weird positions, that my back was feeling the pain of 4 and 1/2 boat units that were to come. On Wednesday at 9 am my mechanic, Ed, showed up and was ready to help. I found out he was a Porsche and Mercedes Mechanic before he started working on boats. Ed was great, he and I were able to work as a team and the engine came out. You can see to the right that we used a chain on the lift points and it had to be positioned so that first the engine came forward then the transmission had to be low for it to come out. And, out it came. You have about a 1/8 inch of clearance on each side for it to come out. But, out it came. You can see on the left picture that I actually thought ahead and found a bunch of cardboard to put the engine down on. Actually, it wasn't me, my friend Gary told me to get old carpet to put in the cockpit, I couldn't find carpet so I got a bunch of cardboard. Great Idea!!! Thanks Gary! We got the transmission off along with the heat exchanger. When we took off the end plates of the heat exchanger it was obvious it needed cleaning so Ed took care of cleaning it out and when he was done, it was very clean and I can see a difference between the water flow before and after. I'm happy we did this. 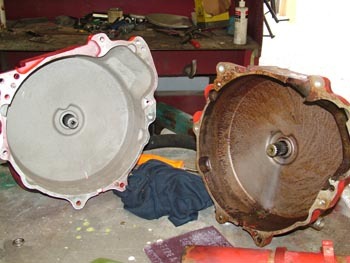 I had also ordered a new starter that I was planning on using for a spare, However, when we took the old one off to get access to the transmission, it was a pain. Therefore, I decided to install the new one and keep the old one as a spare. Hopefully, we will never have to do this underway. Access is not the easiest in the world. To the right you can see the new transmission bell housing to the left and the old one to the right. There is a bit of grease thrown over the old one but besides that, no difference. I will also tell you that we found some other issues while we we had the engine out. 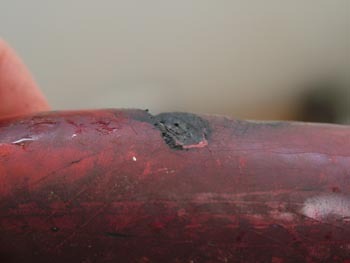 We found that the port side of the transmission hose had a wear spot on it. You can see the picture on the lower left. Ultimately we found that the reason for the wear was the port side motor mount is very close to the hose and that was causing the wear. I'll bet I only had 500 or so hours and this would have failed. 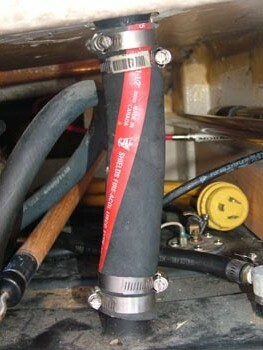 We replaced the hose and also added some chafe protection to this hose. If you own a Gemini , you should check this and probably add chafe protection too. 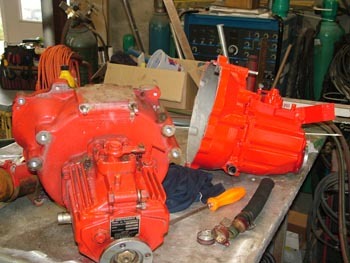 The new transmission painted up nice and red looked nice too. I also painted that heat exchanger and it dried over lunch. So far, we are 3 hours into the project. While the engine was out, I also cleaned up the engine well with bleach to get all the old stains out. 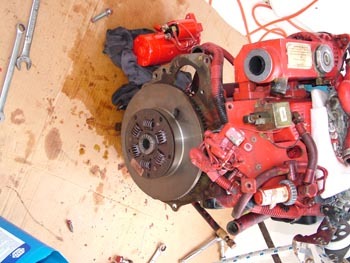 You can see we removed all the motor mounts to pull the engine. That ended up being the easiest way to get everything out since we had to pull the engine forward an inch to clear the bolts for the flexible coupling. So far, we've now found the heat exchanger needed cleaning, a hose partially chafed through, a bad transmission and guess what? I also found the exhaust hose was going bad when I took off the 45 degree elbow which I was replacing. So, I already had a new exhaust elbow based on the recommendation from Westerbeke and replaced it when we put the engine back in along with that exhaust hose. By 3 on Wednesday afternoon we had the engine and transmission back in and by 4 pm we had the engine aligned and all of the motor mounts tightened down. By the way, we replaced the rear mounts when we put the engine back in since I had them on board and one of them was bad. The picture to the right shows hoses going everywhere. That was my job on Thursday morning while it was raining. Put everything back on the engine I took off to get the engine out. By 11 am on Thursday I had the engine running again but since we had to drain all of the antifreeze, I had to also take almost an hour to get all the air locks out of the block by filling, running, stopping, filling....... it just goes on but after an hour, I had it all working great. By the way, the electrical connections you see to the lower right also had corrosion on them so I put dielectric grease on the connections and avoided another problem. In addition, I found two more places that I added chafe protection to. 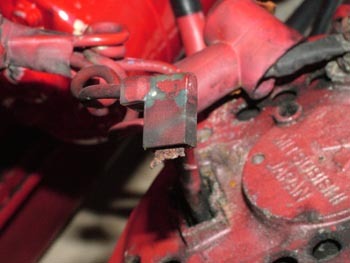 One was the throttle and stop cables which I added rubber surrounding them and wire tied it down to protect them. In addition, I also found the raw water intake line could rub on the starboard aft motor mound so I also added rubber around that hose too. I think we have had a great opportunity to find potential problems and prevent them from causing a problem for us in the future. By the way, we aligned the engine with the new motor mounts and now have it perfect in the horizontal direction and under 3 thousands in the vertical. It should be right. After all was said and done, I feel very comfortable with the entire project. In addition to the parts I needed and the parts I put in to avert future problems, I also picked up a bunch of filters for our fuel system since I was at a Westerbeke place. I'm ready for the Bahamas' I hope. Well, I also picked up a vacuum gauge for our fuel system and that I'll show you later when I get it installed. The purpose of the vacuum gauge is to tell us early on if we have a filter problem. Well, the good news was that we spent 4 1/2 boat units and I don't feel like I've been taken advantage of. As a mater of fact, I feel like the people at Sailcraft have worked with me and allowed me to use my skills as much as possible to reduce my bill. The reality was the extra starter was over 600 bucks the filters were almost 200 and that means the replacement of the transmission was about 3.7 boat units with sales tax. Of course if I wouldn't have done all the other labor, it would have been at least 4.5 boat units. They treated me right, in my opinion, and I talked to Phil, the head mechanic, and he told me they don't mind working with boat owners who can help. This is a great philosophy and they are helping us cruise. 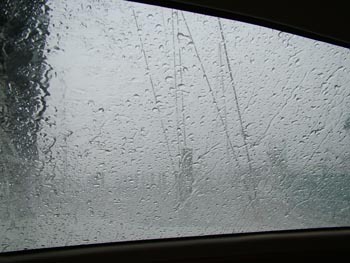 We are now back at a marina and waiting for the rain to quit. 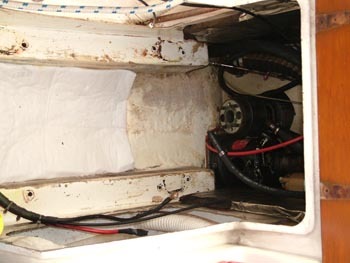 I have some more boat cleaning to do and we also want to put an hour on the transmission testing it before we leave. 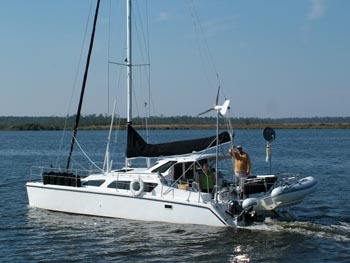 I expect we will be out of here by Sunday for Beaufort, NC and then we will be off for Charleston, SC arriving by Thursday. It looks like we are transforming from mechanic to cruiser again. Oct 27 - And the rains came! Yes, it rained while I was putting all the parts on the engine and it didn't stop until this afternoon. We had some work to do on the boat that didn't get done although we are leaving tomorrow regardless, it is time to move south and you have to go when it is time to go! Yesterday, Carol who is the Carol of Ashley and Carol who have seen all of the Caribbean and Venezuela, loaned us their car so we could reprovision for our trip south. Thank you very much. We bought out the store because we aren't planning on stopping unless it is for fuel before we get to Charleston, S. C. I'm looking for warmer climates and it looks like Monday we will be wearing our insulated underwear again. Remember the Sponge Bobs that Deb purchased back in Panama City? They will be coming out on Monday believe me. I wanted to go outside tomorrow but after looking at the weather forecast, I found out there are supposed to be 9-15 foot seas offshore on Monday so I think we will stay inside and just do our 10 hour days getting down to the warmer weather. By the way, today (Saturday) we went out and tested the transmission at full speed. I was able to move the throttle forward up to 3000 RPM's, which I don't think I've ever done before, without slippage. The transmission is great, the alignment is great also with no vibrations and we are ready to go. Therefore, we went in and pumped out, filled up the diesel tanks and tomorrow I'll fill the water tanks and we are off for parts south. It sounds like a theme doesn't it! No pictures because it would only be depressing with all of the rain. 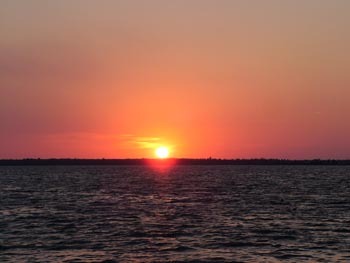 Regardless, it was a great sunset with beautiful oranges, reds and beautiful colors in the sky as the sun set. It actually reminded me of the last afternoon that I saw my Uncle Russell the day before he passed away. He had lost his vision before he passed and the last afternoon he was alive, I described all of the colors in the sky of the sunset and he said he could see it too. I believe he could because he was an architect and a wonderful visionary. Perhaps tonight was a remembrance of him. Overcome obstacles and move on, I think he would like that. Tomorrow we leave in about 55 degree weather and hopefully get to a high of 70. The next day we get to enjoy a 45 degree night and out come the insulated underwear so we can keep moving south. It may be 5 or so days before we update again and hopefully we will get some great pictures and a wifi site so we can update before we arrive at Charleston. Thanks for checking in with us and updates will be just around the corner. Oct 29 - Can you say Burr! Cold! Well, I can and it is. 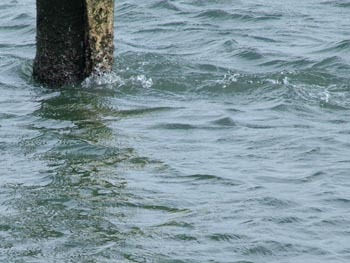 We are now back in the area where currents and bridges are a factor for us moving south. At one point yesterday I was making 9.2 knots on the GPS and then a while later I was doing 5 knots. This was because of two factors. First, we have current that sometimes is with us, called a push, and sometimes against us. We like the push but there are so many openings that it all seems to cancel out. On top of that, you probably have figured out that a big northern front is coming through this area and we are getting 15-20 knot winds so we can not only motor, we can use our sail and of course that is motor sailing. 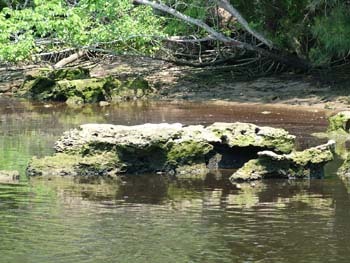 We anchored the first night in an area called New Hammock Bay which was dredged out by the US Army for their usage. They also allow us to anchor there. If you are interested, it is just below Camp LeJeune. As in our trip up, the firing range across the Intercoastal was not active so we didn't have to wait for them to practice blowing things up. 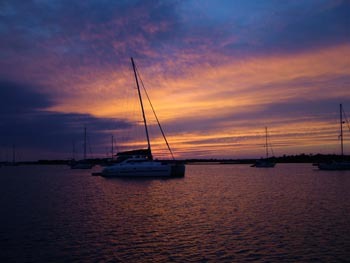 As you can see in the picture to the lower left, we had a great sunset and we had some other people anchoring with us. In the end, we had 17 boats anchored here. As you can see in the lower right, we all left together, which means we left at daybreak and guess who was in the lead. Yep, I lucked out and our boat stayed in the lead most of the day until the bigger boats finally caught up. It was pretty cool traveling with a gaggle of boats, well at least that's what I think it might be called. As we approached the Wrightsville Beach Bridge I think I found Gilligan's Island. Yes it is sinking but I'm sure at low water there are lots of people who watch all the cruisers trying to maneuver in the 2.5 knot currents while trying to not run into the bridge that is about 100 yards further south. I still like the Palm tree however and the creativity. I'll bet the leaves are green all year long don't you think. 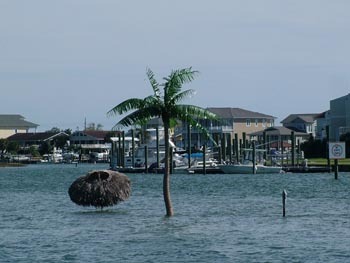 Just to check, I talked to my friend Bill on Veranda to see if they remembered the palm tree and he did. It, of course, is plastic and he remembered several powerboats pulled up with the chairs sitting watching life go by. 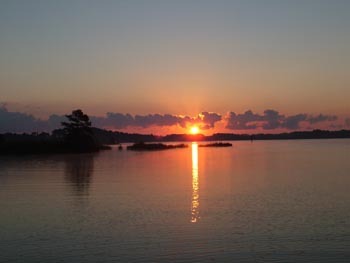 Isn't it great that life travels on the water. Tonight, Monday, after an 11 hour day moving on the water we cooked some pork steaks on the grill, made a great salad with my own dressing and hung out. 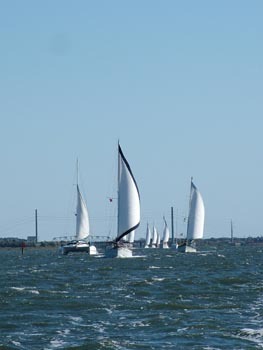 As we came down the river for Cape Fear, drives you crazy doesn't it, a place called Cape fear, anyway, (commas are killing me here) the wind was with us and the current was also with us so we were making up to 10.2 knots. We ended up with 60 nautical mile day which is really good. So we just layed back for a glass of wine and as you can see to the right, Jimmy Buffett was hanging out too. He loves attention and really likes it when we stop and I get to pay attention to him. The real news is that there is a tropical storm coming at us. The name is Nole and by the time you read this, it will probably be all over. 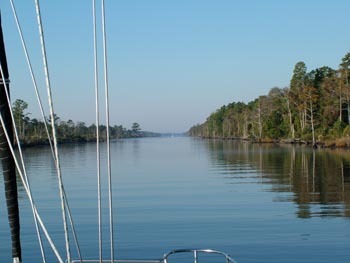 We are heading for a long day again tomorrow and will be anchored in the Great Waccamaw River. If we find out tomorrow that the storm is really coming at us, we can go another 5 miles at least up the river and set up our anchorage of three anchors and wait it out . I actually am not afraid of what this brings because we are prepared for the possibility. Adventure is in our blood, or should I say my blood, and we have put out calls to people to watch the weather channel and let us know where the storm is heading. Thanks to all that will be letting us know. I don't know what they did without cell phones but I'm happy that I will have a short wave receiver in about 3 weeks so I can hear everything there is about the weather. Oct 31 - Remember the Rock Pile? This would have been in late May when we came up the east coast. Well, now we are heading south and we are getting ready to go back into the Rock Pile. 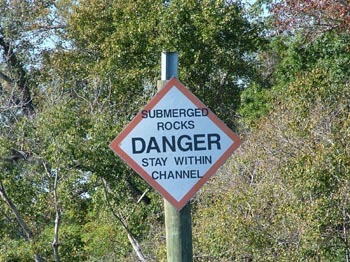 Of course you can see that the sign warns you but we are now at high tide and the channel looks clear. In the back of my mind is that picture I took back in late May that you see to the lower right. Yep, those rocks are just below the surface ready to tear a hole in my hull and see just how much water that new bilge pump can actually pump! As recommended by Gary, we stayed in the middle and I drove the entire time so I didn't wonder out of the middle. I remember Garry telling me that if you have to trade "paint" then trade it but DON'T GET OUT OF THE MIDDLE. 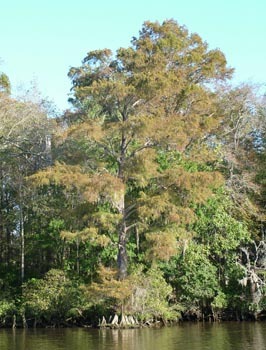 We anchored in the Waccamaw River and the next day we were passing the Cypress trees which were just beautiful. They are intermixed with all of the other trees along this route which is very remote and it is great everything is working right. Oops, did I say everything was working right? Wrong, another problem. 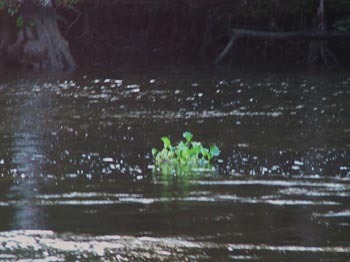 But before we get to the problem, there are these plants that just float up and down with the tides. It looks like they are having a great life but I'll bet from time to time they say, I know I've been here and done this before. They probably see the same 10 miles of scenery every day. I guess that is better than the ones that live in the ground. 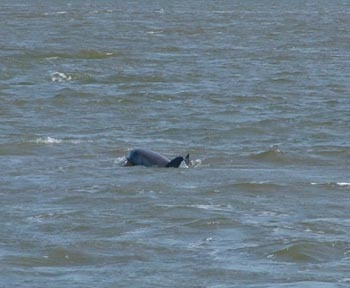 Today as we were moving through another channel, the dolphins came up and jumped. It looked like they were going to join us and swim for awhile but they didn't. Instead, I ran in to get the camera, don't you just love that 10 times zoom, and got this picture. There were actually four of them in the pod feeding on the fish in the canal. Now the problem. We started the engine this morning, like every morning, and the Teach didn't work. It worked perfectly yesterday and now it doesn't work. Great. I had stopped for fuel about 20 minutes later and quickly sprayed some WD-40 into the connector to clean it but thought, I just cleaned these connections. It didn't work. so I just set the throttle at the frequency that I thought was right and we went south. I'll bet you know we are looking for warmer weather. After we anchored, 10 hours later, I began to troubleshoot the problem. I cleaned the connectors again with no luck and then took out the schematic to actually do some troubleshooting. I ultimately found the connector you see to the lower left broken off. You can see the connector better on the lower right after I got it out of the plug. This is no doubt a result of the engine removal. I'm just happy that i did two things right. First, years ago, I bought a spare alternator from a guy who changed out his alternator. The second thing was I insisted on getting that alternator bolt loose just in case I ever have to change the alternator. Oops, I think I've changed every accessory on the engine. After we get the alternator rebuilt or a new one, we are ready to stop troubleshooting and ready for another 2000 hours of uninterrupted service. More later, we are continuing on tomorrow and will bypass Charleston, anchor another night and then get to Beaufort, S.C. on Friday. We'll see how long our repairs last. Hopefully forever.... or a couple of days.